Boca Chica beach, Dominican Republic. 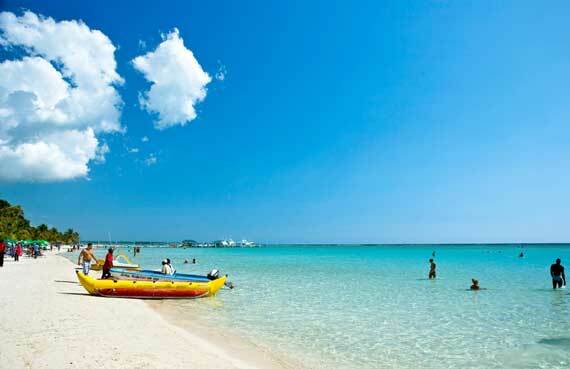 Boca Chica has one of the most beautiful beaches of the Dominican Republic. The sand is white and soft, the water is calm, clear and shallow. Its waters form an inlet that stretches for over a kilometer and a half. About 500 yards offshore is a reef in the shape of a semicircle, forming a large natural pool shallow. The reef acts as a natural breakwater to the Caribbean Sea, so the cove is usually calm as a mirror. This sea is ideal for swimming and all sorts of water sports. It 'a sea particularly suitable for small children. If you look for a beach with everyone, but all the services, that Boca Chica is really special. A stone's throw from the center, can be reached on foot or by motorcycle taxi. Hotels on the sea. Coco Playa Arena, boutique hotel on the beach a hundred feet from the sea, A/C rooms and mini-suites, bar and restaurant. Hotel Madejra, 20 meters from the beach and Duarte in the center of Boca Chica, A/C rooms, apartments and suites, wi-fi, sea view. Restaurants on the sea. Boca Marina, Neptunos, El Pelicano, The Boat House, Village on the Beach, Da Nancy, La Terraza, Millionaire Beach Club, Puerco Rosado, Sporting Club, Bocana Beach Club. Clean sea. Excellent conditions of the sea in Boca Chica Beach. According to the Ministry of the Environment and Public Health. Deep sea fishing. Deep sea fishing is a great adventure. Diving. Very helpful and patient instructors of English and Italian diving schools in Boca Chica, are available for beginners as for experienced divers courses for every level and / or group dives in the various parks: La Caleta National Marine Park, Catalina Island.